First, we had to delay starting our house because we had to move to Portland for almost 2 years to help care for the Hubby’s mom. We ended up needing to plan a bigger house than we originally thought in order to accommodate Hubby’s folks moving in with us. 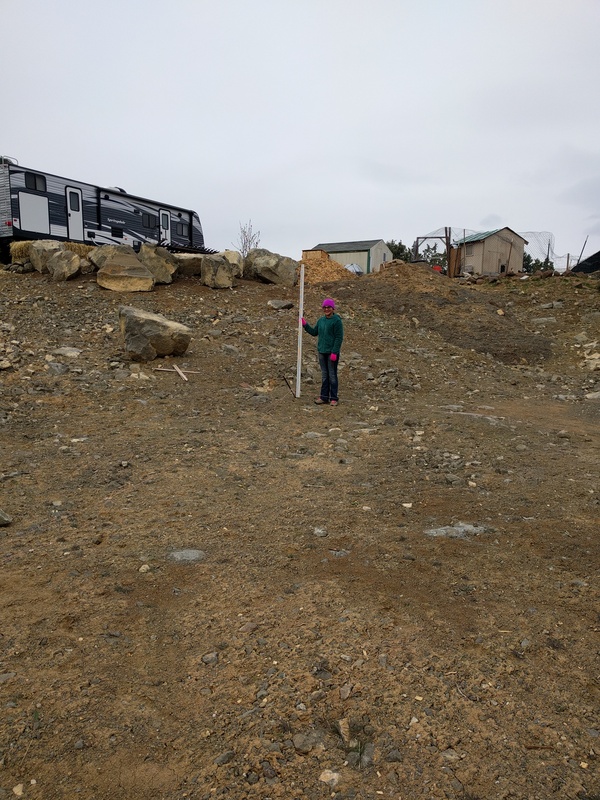 Then we had to completely move the location of the house from one side of our 40 acre property to the other because the original site didn’t have a good spot for septic. We planned to get more work done over the winter, but the weather did not cooperate. And here we are, having to change some of our house plans. It wasn’t a major change, we just changed the directional orientation of the house a few degrees. It amounted to moving the house about 15ft. Not that big of a deal, except that it really cuts down on the amount of driveway and parking area we’ll have. It was just feeling…Well, cramped. And yes, we do have 40 acres, but only about 3 of those are not on the side of a steep hill. And the house pad is carved out of the side of one of those hills. So we are kinda limited on space in some ways. But I digress. Since we changed the angle of the house, we had to look at where the detached garage is going to be built and how to get more space. Which made us consider doing some earth moving in a area where we planned to put our orchard. Which would give us much more space on the house pad, but where to put the orchard instead? Which made us look around and decide that the other logical place for the orchard is actually better. Which made us realize once again that when plans have to change for one reason or another, there’s usually a silver lining. I could go down the list at the beginning of this post and show how because we had to do it differently than originally planned, we’re actually better off now than we would have been had our original plans gone through. We try to remember these truths when making our plans, and realizing that when plans change, it’s all for the best, in one way or another. This entry was posted in Building a Home and tagged Building, Construction, God, Homestead, Homestead Kids, Homesteading, Orchard, Planning, Trees on April 13, 2017 by Maridy. Boy, do I hear you about having to make changes! Unfortunately, it isn’t the changes that are holding up our building plans, it’s our engineer! I’m glad you found a better place for your house and orchard, but what about the trees you have already planted? Hopefully you will be building soon! Yeah, having to wait on the plans is a pain. Hopefully yours will be approved soon! And we actually started building the footings this week! So exciting!